You are here: Home » MEDIA » Books » Fantastique: Interviews With Horror, Sci-Fi & Fantasy Filmmakers (Volume I) by Tony Earnshaw (book review). 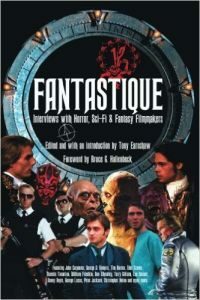 Fantastique: Interviews With Horror, Sci-Fi & Fantasy Filmmakers (Volume I) by Tony Earnshaw (book review). A veteran film journalist and cinema programmer, Tony Earnshaw (who, in the interests of full disclosure, has also been a colleague of mine in the past) has met a large swathe of the great and good of the genre world. From George Romero to Quentin Tarantino, Earnshaw has talked to them all. This collection of interviews with genre filmmakers is an eclectic bag of just some of the people that Earnshaw has chatted to over his career. On the one hand, the book works as ‘just’ a collection of interviews to entertain ardent genre fans. Earnshaw is a good interviewer, managing to be knowledgeable and engaging without overshadowing his interview subjects. The interviewees chosen for this book are generally an engaging bunch, enthusiastic to talk about their projects and their pasts. The book also works as an interesting exploration of the changing fortunes of genre cinema over the past few decades. Thus we get the likes of Simon Pegg and Ben Wheatley talking about their hopes for the future with an interesting note being that Wheatley’s ‘A Field In England’ seems to be originally conceived as a quasi-prequel to his underrated drama ‘Kill List’ while Danny Boyle seems a long way off his ‘national hero’ status that the Olympic Opening Ceremony bestowed upon him. Indeed, the interview with Boyle sees Earnshaw note that, at the time, ‘28 Days Later’ was one of the very few zombie films made over the past few decades. A slight irony given that almost every second horror film now seems to feature the walking dead.. The interviews show just how cinematic tastes have changed and how many filmmakers have gone on from humble beginnings to being some of the most important auteurs of the current era. Each interview is of its time which has its positive and negatives. Whilst it’s fascinating to read just what people thought at the time, the interviews does lack a bit of commentary to put things into some sort of historical context. For example, instead of the film synopses which accompany the beginning of each chapter it would have been great if Earnshaw, an often great and personable writer, to add a little personal and historical background to the interview and film we’re about to read about. This is a minor niggle in a book that is not only entertaining for horror and SF fans but an interesting historical document examining the highlights of fantastic cinema over the past 20 years. « Awesome science fiction and fantasy round-up (Offworld Report: Thursday 19th May 2016).